Oh Yeah? You seriously try to spell it, don’t laugh till you know the toil, ya dig? (I’m sorry for some reason I wanted to say that like Undercover Brother, it wont happen again). Yesterday I came home to a leaking pipe on the second floor and had to hunt for hours(alongside a plumber) only to solve the problem (myself) by tightening a screw, yep a single friggin screw, I felt like I coulda kicked right thru the bathroom wall…like some kind of really tall and strong beast-like animal of rage from a made up story. No I’m not talking about that old Scientology God again, I mean Star Wars! [queue blaring trumpet]. So toss your gander up there right quick, see that, that’s a wookie jacket, skinned from the finest fictional fur this side of Alderaan…. which I guess is relative considering it’s an orbiting planet, but anyway moving on. If you’re anything like me, and I’m sure a sanctioned state mental health exam will reassure that, you want this because it would make your reenactments that much more believable on furry-fetish hot-candle night at home opposite the PETA rally. 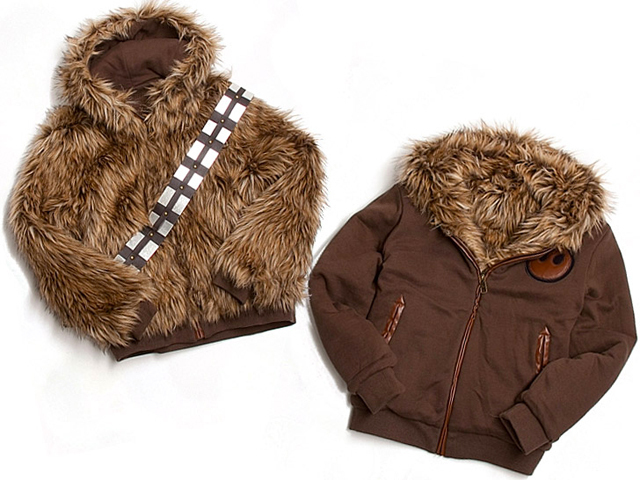 Odds are good this thing is super warm (Chewie on F*in Hoth, nuff said) and would go perfectly with your tauntaun sleeping-bag, also has the benefit of having a sash… and when was the last time you could say you had a sash, really now don’t you just feel dashing? I wonder how soft the “fur” really is…like can I pour myself a hot chocolate and just wear nothing under it for the night. Play some old music by the fire, smoke a pipe, and just stare at the wall. Yeah awesome……. Oh! right, still here, um so also the original Dear Abby writer,Pauline Phillips, died at the ripe (questionable) old age of 94. What a true heroine, somehow she was able to take the everyday activity of pushing your own beliefs onto others and turn it into a respectable and sought out position, God bless America. Mayhaps one day I will get my dream of combining the rigors of video game marathons and pie eating into a well-paying job, maybe even with 15 minute beer breaks every 2 hours. But alas, until then I am your humble yet incredibly talented and viciously witty writer. 17 Jan	This entry was written by CatastroFUCK and published on January 17, 2013 at 6:03 PM. It’s filed under artsy, Awesome, Movies and tagged Chewbacca, Dear Abby, harsh weather, lewd bedroom antics, Oscars, PETA, plumbing disaster!, star wars. Bookmark the permalink. Follow any comments here with the RSS feed for this post.